The Washoe people have lived in the Lake Tahoe region for countless generations. They shared a common language, ancestral traditions, legends, and a great reverence for the lake. Cultural preservation, and specifically language preservation, is important to the Washoe people and the Washoe Tribe today. 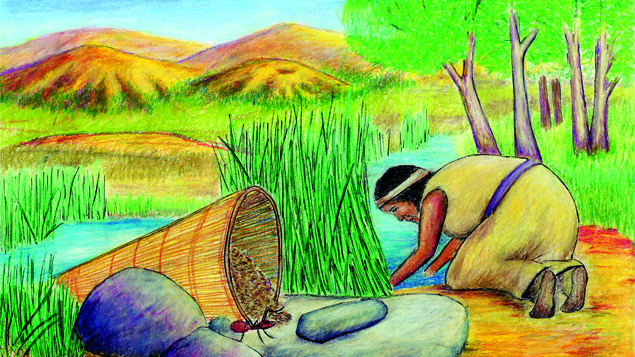 In an effort to revitalize Washoe language and traditions for future generations, the Tribe’s language program—known as the Patalŋi Me?k’i Head Start Immersion Nest—recently published a series of children’s books with support from the Administration for Native Americans. Four artists, BillyHawk Enos, Kevin Jones, Charles Munroe, and Mauricio Sandoval, illustrated the legends. The stories were retold and translated by Lisa Enos and Washoe Elder Melba Rakow. This exhibition features the original illustrations. The books accompanying these original artworks are for sale in the Museum Store. Sales help to support Washoe youth language revitalization programs.